The refreshed Equinox will feature a more sculpted front fascia, LED foglights and more-pronounced front wheel well. DETROIT -- The Chevrolet Equinox crossover -- sales of which continue to march higher nearly six years into its current generation -- is getting a face lift. Chevy is scheduled to unveil a refreshed Equinox on Thursday at the Chicago Auto Show. 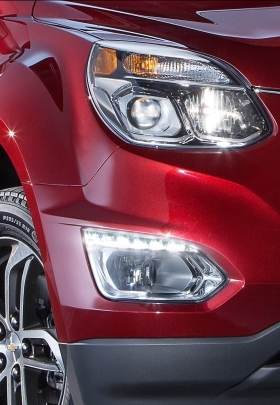 A teaser photo issued shows a more sculpted front fascia, LED foglights and more-pronounced front wheel well. General Motors hopes that the update for the 2016 model year will jump-start momentum for the Equinox, its top-selling U.S. crossover and No. 3 nameplate, behind the Silverado and Cruze. While 2014 marked the fifth straight year of U.S. sales growth -- up 1.7 percent to 242,242 units sold -- the Equinox lost market share. The Equinox is scheduled to be redesigned in 2017, most likely as a 2018 model. The current-generation Equinox has been a hit since it went on sale in mid-2009, but now is among the oldest entries in a crowded compact crossover market that includes the Honda CR-V, Ford Escape, Toyota CR-V and Nissan Rogue. “In one of the industry’s most competitive segments, the Equinox continues to win customers with its value-driven balance of performance, versatility and personal connectivity,” GM North America President Alan Batey said in a statement. Even with the refresh, Equinox sales could be pressured by the recent introduction of the Trax small crossover to Chevy's lineup. Chevy recently cut the Equinox's base price to $22,995 including shipping, leaving it about $2,000 above the base Trax. The GMC Terrain, a sibling to the Equinox, also is scheduled to get a refresh for the 2016 model year.